Regular readers of this blog must now have an idea of my more usual subjects. Nature, family, all these things that are so quiet. Not many sports or action related photos to be found. But I remember biking to the other end of the city on the notice there was a fire in a carpet storage facility in Leeuwarden, Holland. It was bitter cold and snowing. I managed to get a few blurry pictures on film and that was it. 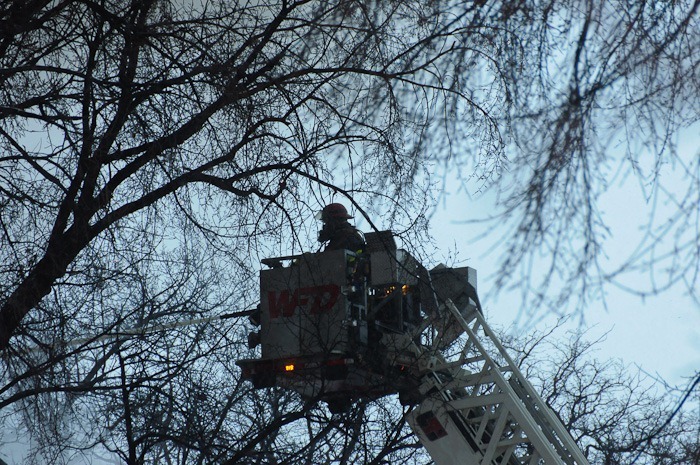 From that moment on, I thought that there was no good way to get pictures of fires. I kind of abandoned the idea and went on taking pictures of less dramatic situations. After all, they are way easier to get, right? So, with quiet pictures in mind, I went to Birds Hill Park in the very early morning, around 6:30AM. I thought I’d do some light painting with some old farming equipment. 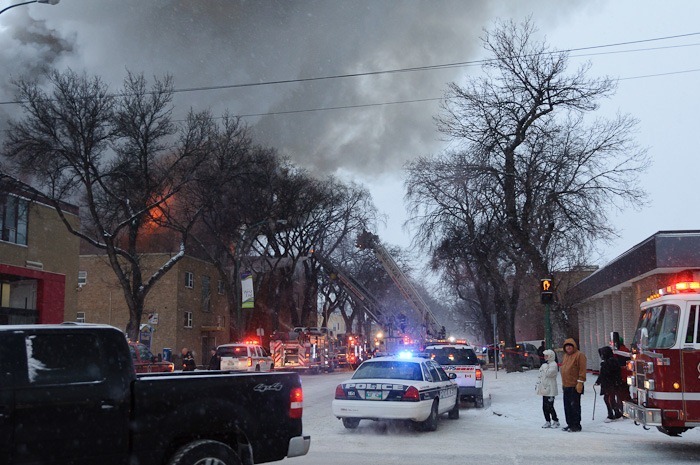 When I drove back over Main Street, Winnipeg I saw all chimneys “smoking” in the cold morning. Then I saw something that was way more than a bit of chimney smoke. I decided to get closer. This is what I was greeted with, still in my car. 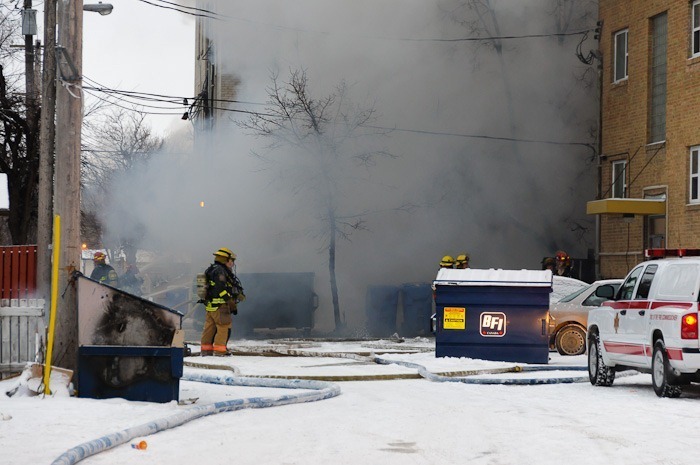 My first thoughts were of a basement on fire with some heavy smoke generating stuff like tires or something. After all, here in Winnipeg many people change between summer and winter tires twice a year. I parked my car and went back to the smoking place. 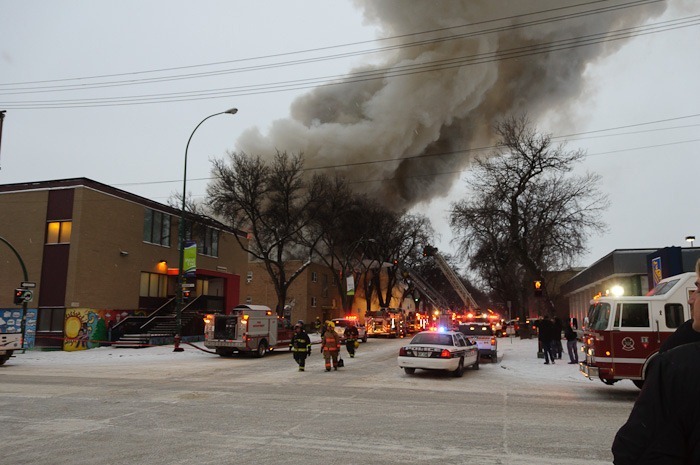 This time the fire was clearly visible, but still no barriers keeping people out of the vicinity of the burning building. 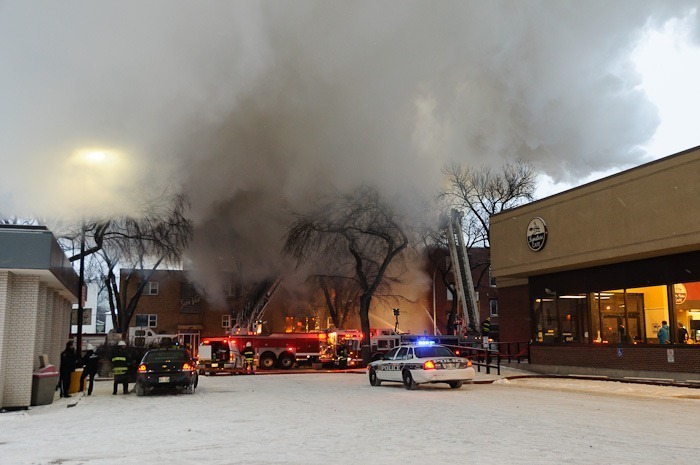 Going to the front of the building, I saw way more activity and the smoke plume that signalled the fire when I was on Main Street, some 5km away. That was a lot of fire fighters there! More than I thought for a small fire. Getting closer, I could see flames though the flashers of the police cars and fire trucks. 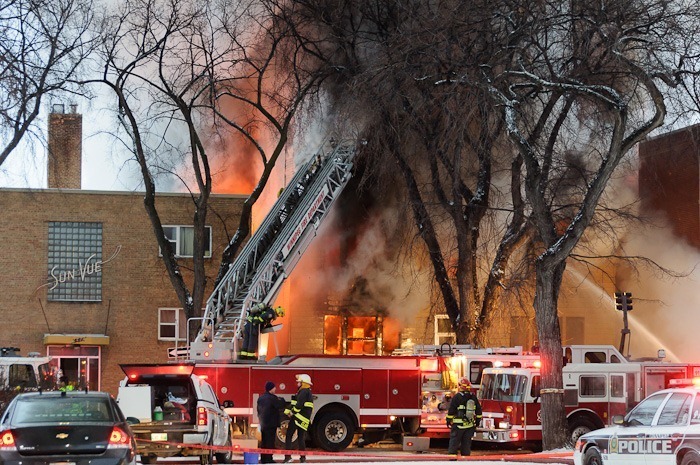 As you can see, there were fire fighters walking away from the blaze without their protective gear. So I decided to take a different angle from the Safeway parking lot, straight in front of the burning building. 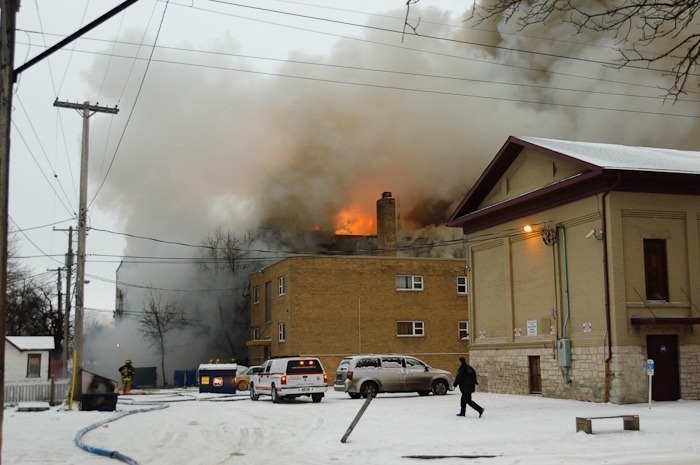 Again, more smoke than flames to be seen, but from here it was clearly visible that the building would soon be lost. 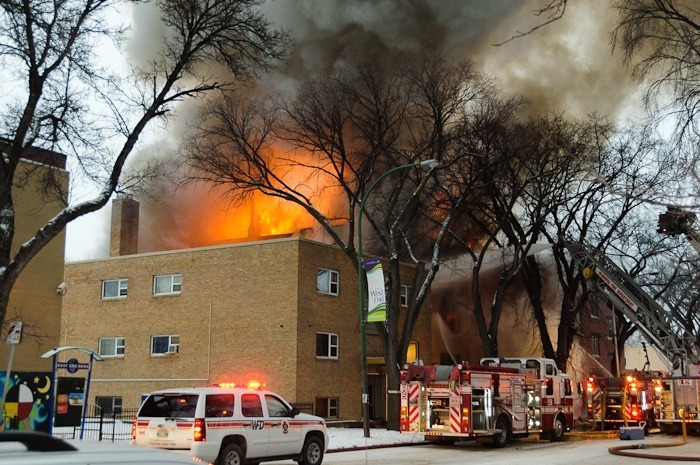 The Winnipeg Fire Department could do nothing else than “calm” the blaze and try to save the adjoining buildings. Having a zoom lens is something that comes in handy in these cases. The perimeter had been secured against nosy people, for their own safety, of course. Zoom lenses can go way closer. An interesting thing on the site was to see so many people taking pictures with iPhones and other cameras like these. I guess that for that reason, nobody took notice of me with a bigger camera. Unlike the time I was taking pictures in Leeuwarden, where I stood out like a sore thumb. It was time to move away from the fire, my car was taking up potential safe parking and I didn’t want to be in the way of the rescue people. 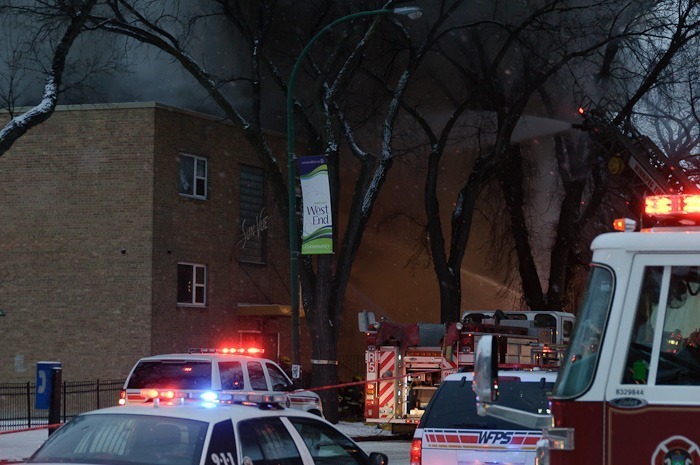 Winnipeg Transit had sent 2 buses showing “Emergency Shelter” for those who had been evacuated from their homes. Also, I started smelling as if I had been barbecued for 30 minutes. It had begun snowing again too. Looking back from a small distance it was clear that the building was lost. I saw no ambulances on the scene, all 50 inhabitants of the building and the neighbouring buildings had been evacuated, 19 of them went to hospital with smoke inhalation related problems, nobody had been killed. About 30 minutes after I had left, the building collapsed, ending its life once and for all. 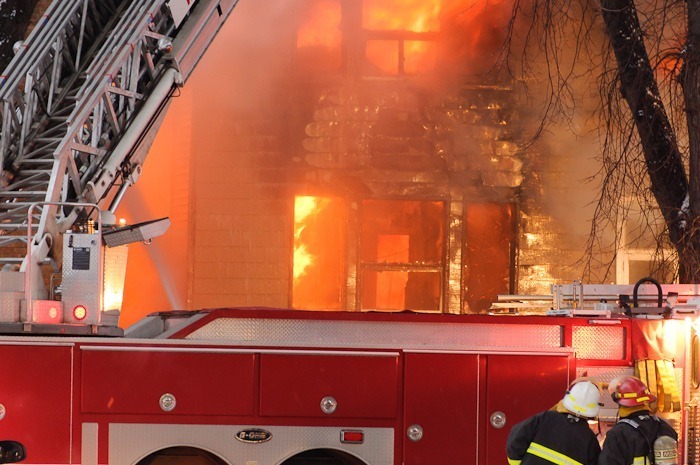 An enquiry has been opened to determine the cause of the fire, arson is not excluded. Back in the days, I would have been called a sensationalist for taking pictures like these. For me, this was a photo “opportunity” , something out of my comfort zone and something different. Knowing that all people were safe, even with all their belongings lost, made taking the pictures easier. 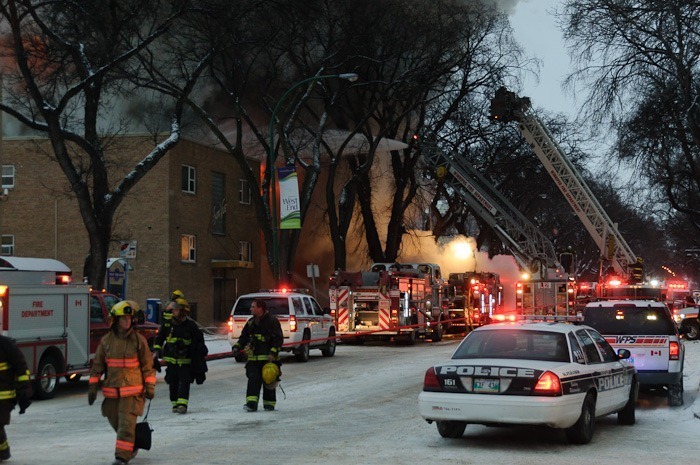 The Winnipeg Fire Department was there to take things under control. The only thing for me to do with my camera was take pictures. No sensationalism involved.